I first joined MCS in Session 1 of September 2014. The first person I met was ZerosSoCute, who was just getting her Captain rank from CrypticCabub at the time. I was blessed with my own Captain rank in Session 4, in April of 2015. I’ve enjoyed making friends with students and staff members, and it’s always great to see returning students each session. I was promoted to HeadGM at the beginning of Summer Camp 2015, and received Teacher about a week into Session 3 of 2016. Moderating isn’t the only thing I like to do, however. 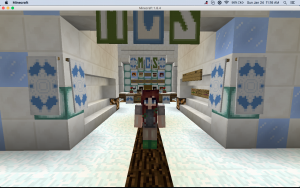 I also enjoy map building, drawing, making minecraft skins, and playing minigames with students and other moderators. I’ve met some of my closest friends while spending time in-game. My sister, Riah, and my mom, Crafty, have helped me learn so much and helped me mature both as a person and a moderator. Though I do know a lot about Minecraft and MCS, I still have a lot to learn. I’m so glad my mom found this program, it has been an amazing experience to work and play among so many wonderful people.